In southeastern Arizona, Plumbeous Vireos (Vireo plumbeus) are common mid-spring and summer residents in pine, pine-oak, and riparian woodlands in the mountains. They are rare winter residents in lowland riparian areas and are uncommon spring and fall migrants in all areas here. On a visit to the Sweetwater Wetlands in April of 2006, I spotted numerous brightly colored warblers moving through the trees. Yellow-rumped Warblers (Dendroica coronata) and Painted Redstarts (Myioborus pictus) were especially common there. I tried to get some photographs of these beautiful birds, but the warblers were either moving too fast or just too well hidden by the trees for me to get any really good photos. While I was attempting to photograph the warblers, this Plumbeous Vireo flew up and perched on a twig just above my head and gave me a curious look with one dark eye. After determining that I was not interesting after all, the Plumbeous Vireo decided to ignore me, and it then joined the warblers in flitting around the tree looking for insects. Plumbeous Vireos used to be classified as Solitary Vireos, along with two other species, Cassin's Vireo (Vireo cassinii) and the Blue-headed Vireo (Vireo solitarius), and they all share the Solitary Vireo's characteristic white spectacles around the eyes and over the beak. This characteristic used to make Solitary Vireos rather easy to identify, but now that this one species has become three, it can be quite difficult to identify them. 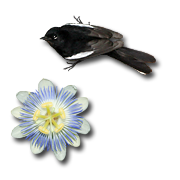 Plumbeous Vireos have the dullest and grayest coloration of the three, while the Blue-headed Vireos have the brightest and most contrasting coloration. 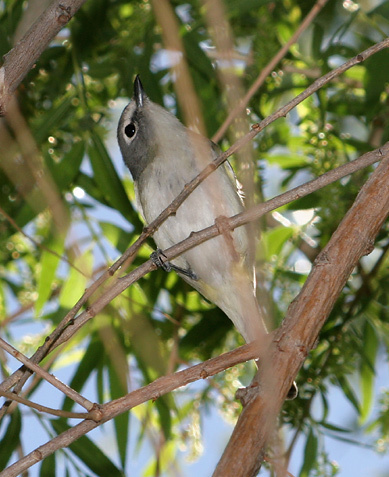 Only Plumbeous Vireos and Cassin's Vireos are found here in Tucson, and the Plumbeous Vireos are the most common of the two here. I have another photograph of a "Solitary Vireo", but I was unable to identify it because this bird wasn't quite so dull and gray and thus clearly a Plumbeous Vireo.